This is one of the designs from our very popular Felt Series. . The angels have been designed so they can hang as a swag (holding hands) or they can be a door hanger (as pictured) or they can be individually hung on your Christmas Tree. 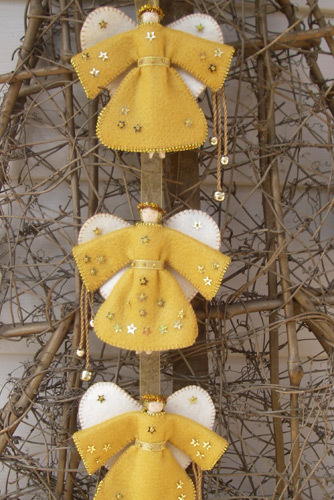 This kit has everything you need to complete 3 gorgeous Christmas Angels and the patterns have very detailed instructions to ensure completion.. The size of an angel is 13cm (5in') tall. Pattern & Full Kit... Includes your pattern, buttons plus all the fabrics, materials and notions needed to complete your project.